Across Tasmania, fathers of all kinds, many of whom left school with low literacy and have been long-term unemployed, are getting a second chance to learn through a thriving network of dads groups, while their kids play on the swings outside. Quest meets the man whose own learning journey has made it all happen. In a quiet suburb of Launceston, Tasmania, a group of seven or eight weary-looking men are gathered at the end of a long day. There’s a sea of shorts, long beards, tattoos, and blundestone boots but they are not at a building site or the local pub. This is the Northern Suburbs Community Centre, a small fibro building that is swarming with kids of many ages careering through doors and shrieking down corridors while their fathers and grandfathers settle into old worn couches to enjoy a cup of tea. They look out for one another’s children, comforting bumps and falls and checking if they’ve eaten some fruit. This is one of a expanding network of dad’s groups in Tasmania, groups where men socialise, support one another and, increasingly, are getting learning opportunities that, for some, have evaded them all there lives. 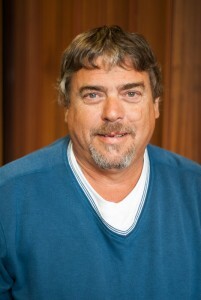 It wouldn’t exist if it weren’t for the passion and dedication of Mick Goss and his own experience with adult learning. 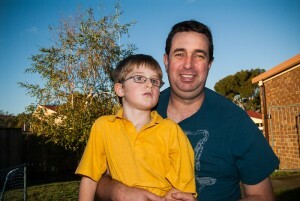 Mick has been the main carer for his son since he was three months old. He was asked to coordinate a Dads’ Activity group by Relationships Australia after successfully initiating a dads’ playgroup in 2003. 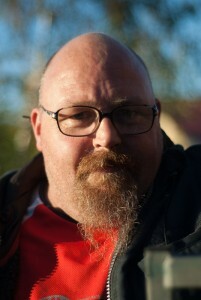 Initially he was reluctant to take on the position; he had been unemployed for several years with a back injury and had low literacy, having left school at fifteen to work in bakehouses and timber yards, but with the encouragement of his support worker at Relationships Australia, he decided to give it a go. 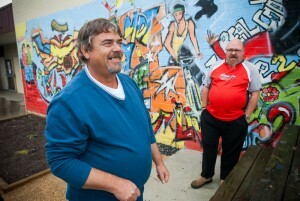 Based at Ravenswood Neighbourhood House, the group’s activities were initially pretty simple; “sausages and hamburgers and sitting around chatting”, but Mick soon realised that the dads were interested something more; “They were loving coming together but they also wanted to learn,” he says. In the meantime, Mick had been doing a bit of learning of his own, prompted by the other staff at Ravenswood and his embarrassment at the written reports he was asked to submit; “It was shocking. I used to hide my spelling mistakes by scribbling,” he says. He stared with basic computing and the impact on his self-esteem was enormous; “We had a great person teaching us and I wasn’t the only one in the class, there was three others. They built my confidence up. I realised there was spell check!” Mick says. Mick’s computing class spring boarded into a two-day child safety course and his portfolio started to build from there. Buoyed by the success of his own learning, he began organising training opportunities for his dads’ group starting with ‘Dads in the kitchen,’ a healthy eating and cooking course. Everybody loved it, including the trainer, who threw out her training notes after the first half hour (“Dads learn differently”) and ended up with a certificate, “they were pretty proud,” says Mick. From macaroni cheese, the dads moved onto first aid, computing, mental health and parenting skills. They would support one another, sitting around the table, with the written components of their training while the kids played nearby. In 2009, the Smith Family began to recognise some of the dads’ group training as prior learning for their certificates in Introduction to Community Services. “From there I had three guys go off and do full Certificate II and III,” Mick says. As for Mick’s own learning, he was signed up to do his diploma in family service but has had to postpone due to his own health problems. “In the future I’ll be doing that,” he says. Chris Howard started attending Mick’s group five years ago when he was forced to leave his job in a microbiology lab to take up sole care of his five children. He describes it as “a bit of a shock to the system,” but he soon set about taking up some of the learning opportunities offered within the group. He completed a number of short courses in food safety, child safety, first aid but when he started a computing course, the tutor took him aside and suggested he should teach it instead. Chris bundled up all his training to sign up for the Smith Family’s Certificate II in Community Services and started teaching computing at the Northern Suburbs Community Centre. Now he teaches computing skills in several different community centres and mentors other men in the dads’ group one-on-one to improve their literacy and computer skills. He has successfully applied for funding for literacy programs, ESSIT training, anger management and food safety and is currently lobbying the Department of Community Services for “a bit more education” for dads. Like Mick, David Cook has been a sole parent to his son since he was three months old. David attends two dads groups in Launceston each week and is currently being mentored in his learning by fellow dad, Chris Howard. David was forced to leave school at age 13 due to the sexual abuse he was suffering from his stepfather at home. “It was all around the school and I just didn’t feel comfortable with the police coming up there all the time, so I just didn’t bother going,” he says. Too young to get the dole and unable to face school, he moved into St Johns Street boys’ shelter where he tried to continue his learning in basic literacy and numeracy. “I always loved learning but I’ve always had a disability so I’ve been a slow learner,” says David. Low literacy made it hard for David to find a job and when he did have work he had trouble with basic tasks such as writing down his hours; “Because I couldn’t write it down I ended up not getting paid.” He was in a constant battle with Centrelink due to his struggle to sustain work.